The Barkhouse Boatyard was an important part of the South Shore boating community throughout the second half of last century. Following in the footsteps of their Father John, Lloyd Barkhouse and his brother Donald built dozens of boats of all types and styles at their East Chester, Nova Scotia location. The first twelve Bluenose Class hulls were built there. The Armdale Yacht Club had commissioned the renowned naval architect William Roue to design the new 23 foot sloop, intended as an “everyman’s” boat in the wake of the Second World War. The yard turned out the boats at the astonishing rate of one per week, utilizing what amounted to an assembly-line process, and the first hull was launched on June 1,1946. The heavy band saw pictured below played an important role in that success story. The band saw was in use at the yard up until Lloyd and Donald hung up their tools in the late 1970’s and was eventually removed from the yard and kept in storage at various locations in the Chester area. It is difficult to be sure exactly when the saw was acquired by John Barkhouse. But we know it was manufactured by Crescent Machine of Leetonia, Ohio, and sold by Williams Machinery Company of St. John, New Brunswick. 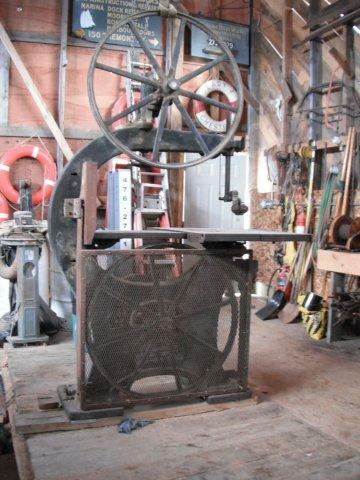 We owe many thanks to Kerry Keddy for ensuring the preservation of this historic saw by allowing Stevens Boatworks to place it in our boatyard. It will now be restored and put back to actual use in our shop. Repairs to the upper band wheel and axial are complete and ready to bolt up. A proper foundation must be built and the saw fastened to the floor. Driving power for the saw will come from an old Lister Diesel engine model SR 115, developing 6.5 HP at 2,000 RPM. The Lister engine was found this year in Bedford on a very cold and snow-bound January day. Despite -12 degree temperatures, once connected to a fuel supply and cranked over, she fired right up. Steven Boatworks extends thanks to Horst H for finding this old beauty. The current plan is to couple the Lister to a salvaged 2:1 ratio marine gearbox which will drive the saw via a double ‘V’ belt. As the photos show there remains much work to be done. The Bluenose sloops are more popular than ever around Chester today and Stevens Boatworks built several after we took over the yard, although it took a lot longer for us than what the Barkhouses were able to do. We are fortunate to have two examples of Lloyd and Donald’s fine craftsmanship in our yard, a beautiful 12 foot lapstrake row boat built around 1960 and a 31 foot Cape Islander built 1970. That’s a story for another day.